The chef’s choice paella changes daily, a showcase for creative whims. The grand old downtown hotel unveils its secret culinary weapon. When City Hall Bistro opened in its lobby-level spot in the remodeled Adolphus, giving the hotel its new pulse—without, of course, upstaging the upstairs French Room—I burned to know where they would take the concept. Bistro? But bistro is overdone. And so they unveiled their secret weapon, the food of the Levant, that arc of the world from Lebanon through North Africa to Moorish Spain, a cuisine named for the rising sun that gives us the smoky flavors of baba ghanoush and warm swirls of saffron. Its flavors play together or take stunning solos, slipping attractively, casually, between brunch and dinner. On my first visit, the background music struck me as a mistake. The intentionally designed soundtrack of The Cars and Fleetwood Mac works for a lunchtime lamb burger. At dinner, it’s a disconnect from the warm glow of saffron-colored leather banquettes, tall gilded mirrors, and bronze coat hooks where black evening jackets hang against subway tiles and Carrara marble. Evening calls for something classier. For jazz? Not all the servers are happy with the tunes, apparently. But an all-day dining restaurant in a grand hotel must perform its function. Meanwhile, there is perhaps nothing better than the house-made kombucha sangria sipped at the bar—halfway between the lobby’s Prussian blue and dark wood paneling and the open door where City Hall Bistro’s bright white beckons. Have a drink with an order of atayef, the savory Lebanese pancake blushing with a red pepper purée and cradling rich duck confit. Here, during happy hour, are little plates, small portions of the things you find inside during dinner, where salads—asparagus with frisée; caramelized beets with Garrotxa; and tomatoes, cucumbers, and labneh—are joined by beautiful roasted carrots rolled in herbed yogurt or hazelnut romesco under grilled leeks. 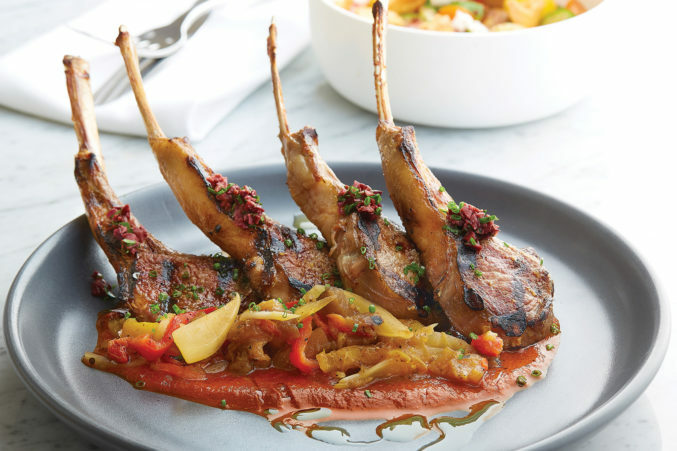 Lamb chops are served over black olive pistou and escalivada vegetables. And so what else do they bring us from that cuisine that rises in saffron gold and dips into midnight ink? For breakfast, the simple tomato toast rubbed with olive oil and garlic is the same you find everywhere in Spain. It made me nostalgic for mornings in Seville, where I’ve ordered it at cafe counters, standing amid a crowd. I haven’t seen anything like this on another Dallas menu. At dinner, the chef’s paella changes every evening, cooked to order in an individual pan until the surface craters and crusts. It’s a canvas for the chef’s whim. One night, oysters and a whole crispy branzino nestled into squid ink-dark rice studded with house chorizo. A simple aioli and a chimichurri with a little heat attended, tucked into oyster shells. A traditional paella Valenciana that remains constant was respectable, save for its mushy prawns. The sea urchin couscous risotto tops creamy Israeli couscous pearls with a few petals of Spanish truffle, a snow of pecorino, and dusky little tongues of sea urchin. Presented in a small, plain vessel like a monk’s bowl, the dish turns luxury on its head. I could eat so very many of those bowls, with their saline tug, the couscous pearls an echo of the sea. The wine list is worth a deep, lingering look. Its smallest denominator is the quartino (an 8-ounce rather than a 5-ounce pour), and its entries are full of interesting turns: a semi-sparkling orange wine from Greece, a Peloponnesian rosé. Our servers made deft comparisons between styles. A Chateau Ksara red, from Lebanon’s oldest winery, is light and tannic with dark fruit. I’m in love with a Slovenian white and with a wonderful Peloponnesian white, with honeysuckle on the finish. Dinner may be best when you gather a group of friends and cover the table with tapas. The vegetarian flatbread reminds me of what happens when you canvas the contents of your fridge the day after a party: leftover hummus, a bit of cold roasted eggplant, some crumbles of feta, a few sprigs of arugula, and that tangy sauce you made with piquillo peppers and vinegar—what was it called? Some drizzles of that, too. Perhaps if the grilled escalivada vegetables were warm and more inviting, it would seem less like cold meze on a flatbread. In stark contrast is the serrano ham flatbread with its warm, inviting cumin-scented béchamel and drizzles of honey. 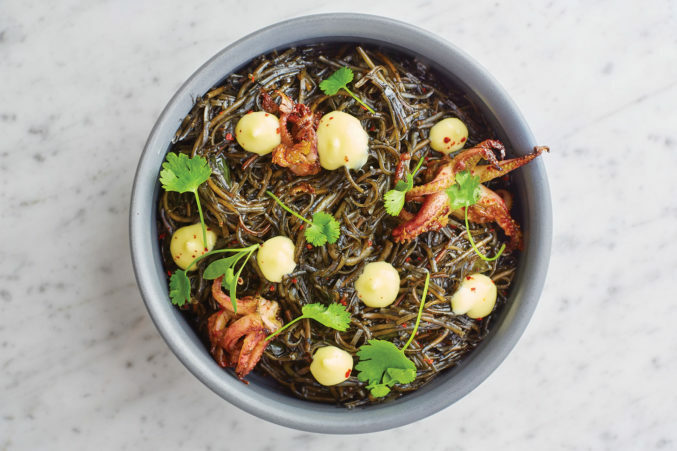 Squid ink pasta gets topped with aioli, Aleppo pepper, and baby squid. The squid ink pasta comes snug in a slate-gray bowl. The night depths are deceptive. Baby squid are twined in pesto, and spots of creamy aioli show off a sprinkle of Aleppo pepper. The pasta itself is earthy, holding the flavors firmly, though the strands are fine angel hair. They have conjured the dark arts for this nest that hatches garlicky baby squid instead of birds. One evening, there was a whole branzino, white flesh steaming, nicely seasoned and easy to eat with pickled fennel, arugula, and a squeeze of roasted lemon. And lamb chops were good, my tablemates kept insisting. Indeed they were, with their black olive pistou, but I hardly noticed, still too entranced by the squid ink’s dark, delicious magic. The pasta, in a slate-gray bowl, is earthy, holding the flavors firmly, though the strands are fine angel hair. They have conjured the dark arts for this nest that hatches garlicky baby squid instead of birds. There are many places to skip dessert. This is not one of them, a claim easily made on the merits of the Spanish churros alone, loops of warm dough like bangles ready to anoint with cool saffron gelato and olive oil-unctuous caramel. Among more abstracted plated desserts—pastry chef Eric Burrell’s work is dramatic and understated, modern but not avant-garde—the crema Catalana is smart, playing up the custard’s silk and adding gentle chocolate and citrus, with a milk foam, candied Meyer lemon turned into fine confetti, and pebbles of cocoa dust. Not everything is perfect. The service can be halting. Things like the shaved asparagus salad can show the kitchen’s inconsistencies. Plates have a habit of cooling before they reach the table from the pass. And, as I say, there were times when the spell was broken and I was reminded that this is, after all, a hotel. No doubt they don’t want me to, but, frankly, I like the back room overlooking Main Street, where you can see the bustle of a city morning through high-set windows. It’s here I feel stitched into an urban fabric. I wish the room were open more often, not just on weekends when there is an overflow from brunch or a downtown Friday-night dinner crowd. In such inflexibilities we feel the cogs of the namesake’s bureaucratic machinery, in this place built on the former grounds of Dallas’ City Hall. But there are some great, bold flavors at work here. It’s in the original that things start to get interesting—where the chefs resist the light, cool touch of anonymity and we can expect discoveries.